Come chat with us - join the CR Discord! 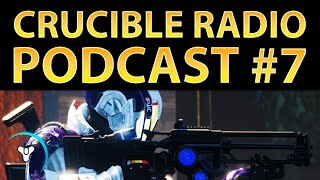 It’s another episode of the podcast for all things Destiny PvP and Swainstache, Birds, and Bones are all ready to go with some in-depth discussion and great advice! And also… Bones makes a rap song? But back to the good advice – the guys discuss tournament play, balancing real life with Destiny, and having a little fun with No Land Beyond and fusion rifles. Pwadigy shows up to discuss the numbers game and fine tuning your sniping strategies. Check out Pwadigy’s montages on his YouTube channel! Special thanks to Cabin Games for providing the music and hosting Birds in the studio this week.